In the prior 2 parts to this series, you have learned about the mechanics of angular measurements and how typical rifle scopes using each system are configured. In part three we will discuss the specifics of reticles in the Second Focal Plane(SFP), First Focal Plane(FFP), and compare the differences of the two. By the end of this article you should fully understand the strengths and weaknesses of each system, and be able to choose which will best accomplish the type of shooting you intend to do with a specific rifle. First we will talk about SFP reticles as they are the most common of the two. Nearly all rifle scopes you have likely used have had a reticle in the second focal plane. In this configuration the reticle is located in the rear of the rifle scopes erector assembly. The easiest way to explain the way this setup functions is to say that the reticle is on the same plane as your eye. When you increase magnification, the image appears to grow larger in your scope, but the reticle stays the same size. The reticle itself does not scale with the target proportionally. In the illustration above you can see the mechanics of how a SFP reticle does not scale with the target. This illustration is not in the proper proportion, so don't draw any conclusion from the exact mil readings. You can however see that the target is small at 5x magnification and the target is large at 25x, just as you would expect. The target is a 30" IPSC, and you can see it measures approximately 3.1 mils at 5x. Now when you look at the 25x magnification, you can see the target looks much bigger, while the reticle has stayed the same size. The 30" IPSC is now 11.6 mils in size. So, we know that in order for mil-based measurements to be accurate, 1 mil must subtend exactly 3.6" at 100yds. As we see here, the linear distance that 1 mil subtends with SFP scopes is dependent upon which power you are on. Typically, the power at which they will subtend correctly is calibrated at the factory to the max power setting. You can also use a bit of math to figure out the correct subtension at the other powers. Setting the power ring on 1/4, 1/2, 3/4, and the math is relatively simple. However, you can never be sure if you are precisely where you need to be on the power ring to make your calculations correct. You also can not be sure if the scope is correctly calibrated at those powers unless you verify it. The primary reason for wanting the reticle to subtend correctly at various powers is so that when you apply a wind hold or hold-over, it will be correct. If you use the above example, you can see that if you held for wind or elevation using the reticle at 5x, you would not be able to use that same hold at any other magnification. Another problem you encounter is accurate range estimation. If the reticle does not subtend the correct distance, then your calculations will be off and will result in the wrong distance to target. There are those among us that can do the math and dial the scope to precisely the correct position to make holds subtend correctly using SFP reticles, however there are none that can do it quickly and accurately under pressure that I'm aware of. With SFP reticles the reticle itself covers a different amount of area on the target depending on the magnification. In the illustration above you can see that at 5x magnification the reticle covers more area of the target on low magnification than it does on high power. If you are on low power, then chances are that the target is close enough that you will not need to worry about it covering too much of the target. The most effective method of using a scope with the reticle in the second focal plane is to rely on your turrets to make the appropriate adjustments. When dialing the turrets you remove the error involved in using the reticle for holds, as your turrets do not care what power the scope is on. One click is one click, regardless of power. So if you need to come up 10.2 mils, you simply dial 10.2 mils into your elevation turret and hold dead center with the crosshair. There are cases when this does not hold true, such as shooting in areas with very rough terrain. It has been proven that on very long shots, updrafts and downdrafts on the face of cliffs or mountainsides can cause a bullet to rise or drop. This falls into the wind reading category and is pretty much all instinct. It's tough to dial instinct. The windage is a little trickier than just dialing it. Obviously when you come up with a firing solution you will be given a windage adjustment to make. The problem with this is that the wind is always changing. Wind holds are every bit as much instinctual as they are precise calculations. As I pointed out above, it is very hard to dial the "instinct" your brain is giving you and fire the shot at the correct moment. One method to overcome this is to "ambush" the wind. With this method you simply wait for the wind to match your dialed adjustment. This idea of waiting for the condition to match the shot doesn't sit very well with the tactical shooting crowd as they are often forced to shoot in any condition due to time pressure. This is especially true for a professional marksman such as a LEO sniper. When the shot needs to be taken, it must be taken. He must make his shot match the conditions, not the other way around. As we covered earlier, SFP optics with mil or moa reticles will usually subtend correctly at at least one power in the scopes magnification range. This is usually the max power the scope offers. You might ask: "Well why not just always shoot on max power then?" It is a good question, but unfortunately usually asked by someone without a lot of trigger time. If you shoot long enough you will inevitably find a condition that you will not be able to use the max power of your scope. This is especially true for optics with high magnification of 15x or more. One of the reasons for this is due to mirage. Some days when shooting long range, the mirage is so bad that you would be hard pressed to see the target at 25x. When shooting from inside a house during the winter the heat escaping through an open window can create mirage so bad that a 1" black dot on white paper at 100yds will appear to move almost 2-3 inches. This means you must dial the magnification down to cut down on the mirage, and then your holds are useless. Even if you do the math, you still will be holding a different number for a set range. Lets say you need a 1.8 mil wind hold where your scope subtends at 20x, and you dial back to 10x. You now have to hold 0.9 mils. The range did not change, nor the conditions, but you have to apply a different hold just because you dialed back the magnification. This gets much more complex if you don't run the power ring in whole numbers that are easily worked with in your head. Another reason you would have to dial back is in a hunting situation. Often the critter won't be cooperating the way stationary steel does. First focal plane reticles are probably one of the more misunderstood items in the optics industry. They are frequently the topic of much heated debate on shooting forums all across the internet. This is mainly due to the fact that FFP rifle scopes are generally more expensive, and thereby not nearly as prevalent. People will often fight things they do not understand. This is especially true of optics due to the fact that a lot of shooters are heavily invested in optics and simply cannot process the thought of having to sell all of their scopes and buy new. 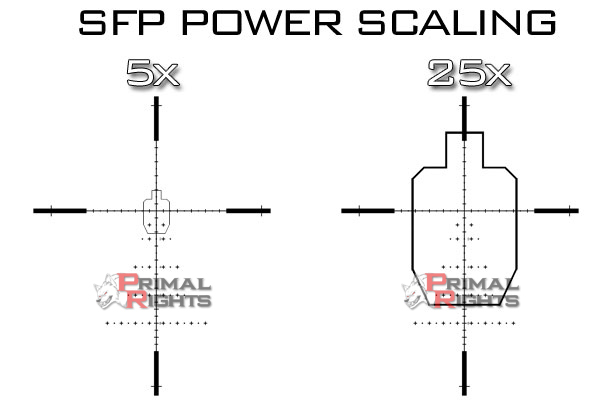 Lets take a look at what makes FFP reticles different and how they are used. FFP reticles are located in the front of the scopes erector assembly. This effectively puts the reticle on the same plane as the target, rather than your eye. As a result, the reticle scales precisely with the magnification of the target. In the illustration above you can see that the target measures 3 mils on 5x magnification. When the scope power ring is increased to 25x, the target still measures 3 mils. When using a scope with a FFP reticle, whether it be a MOA reticle or mil reticle, it will always subtend the same distance at any power in the scopes magnification range. You can dial the power to 5x, 7.4x, 21x, or 25x and the reticle subtension will remain correct. (so long as the manufacturer did their job) At 5x, one mil equals 3.6" at 100yds and it will still equal 3.6" at 25x. This behavior makes the reticle appear to shrink and grow when the power is adjusted. This is true to a degree, but it is actually the entire objective image that is shrinking and growing. The reticle is scaling directly proportional to the objective image. A 30" object at 500yds will measure the same in mils at 5x as it does at 25x. If the 30" object moves closer or farther away, then it will of course measure differently in mils. Due to this behavior, the reticle will always cover the same amount of the target regardless of what power the scope is on. The reticle design itself determines how much area is covered on the target. For instance, a reticle with a main crosshair width of 0.06 mils such as that of the EBR-2 in a Vortex Razor will cover 0.22" at 100yds. This is considered to be a pretty thick reticle. A Premier 5-25x56 with a Gen II XR reticle measures 0.025 mil and covers an area of 0.09" at 100yds and is one of the thinner reticles available. These measurements hold true regardless of the power setting for each scope. Here are some through-the-scope pictures of two 4-16x optics. They are looking at a IPSC cardboard silhouette at 300yds. Don't draw any conclusions from the glass quality, as it was a cloudy day and light was changing drastically. Also, it can be difficult to get a camera perfectly aligned. Needless to say it doesn't do either optic justice. Instead, pay attention to the reticle and how it sizes in relation to the target. 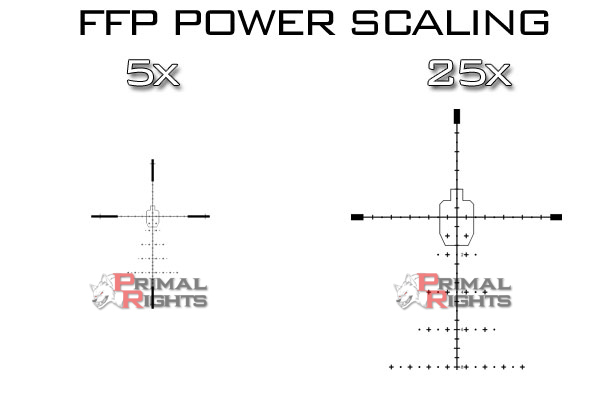 Now that you know the basics of SFP and FFP reticles, the next thing we will cover is which one to choose and why. Each type of shooting situation presents its own unique challenges that must be overcome. When selecting a rifle scope you want to address each problem individually and systematically. You need to play the scenario through and walk it through in your head, step by step. If you setting up a rifle for hunting, what kind of hunting? Where will this hunting be done? What will the conditions be like there? If you are unfamiliar with the area you are going to, you'll want to get some local intel to answer these questions. If you plan on hunting in your own back yard, obviously you will know what you'll be faced with. The primary considerations in selecting a scope that revolve around the reticle have to do with your intended target and where it is located. For instance, if you are hunting deer in the south you will likely be taking most of your shots inside of 100yds and it will be dark. This requires a low magnification scope with a big thick reticle that is easy to see against a dark and cluttered background. For this situation, you would want a SFP reticle. The distance is so short that wind and elevation holds will be non-existant, and the reticle being large and covering a lot of area on low power will be of great benefit. 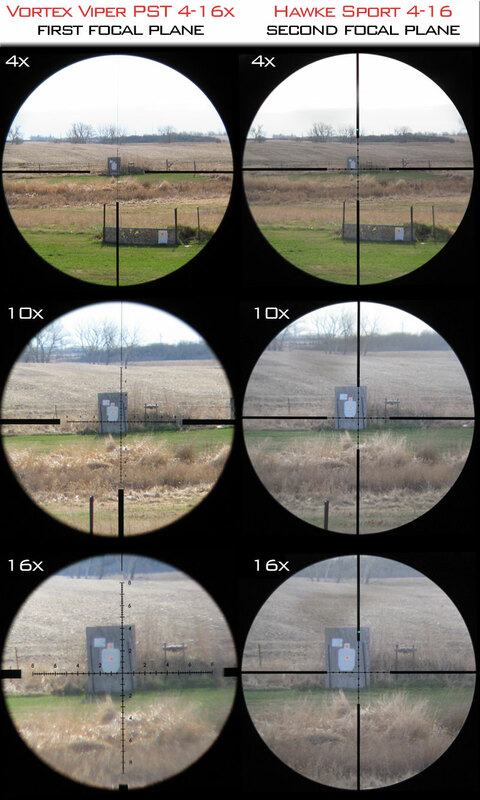 Benchrest competition, or any other target shooting in which the targets will be at a fixed predetermined distance would be another instance where a SFP reticle would be of benefit. For example, if you are shooting 600yd benchrest, you want a high magnification, with a thin reticle. Due to the fact that the targets are always the same size, and at the same distance every time you shoot, you can use the target itself to figure the correct wind holds. This also negates the need for any elevation holds, because you will be zeroed well in advance for the exact distance you are shooting. FFP reticles will work quite well for benchrest competition as well, but the high priced features you paid for aren't being utilized... so there is little point in it. Low stress recreational shooting such as casual target shooting or prairie dog shooting is not that dependent on reticle. Either SFP or FFP will usually work equally well in these situations. In this type of shooting you have ample time to use a range finder, and dial your turrets as much or as little as you want. Fact is, in this type of shooting there is no pressure to beat a clock and no pressure to hit your target. If you miss, you just find another prairie dog. The primary goal of most in these instances is to have fun! Personally, I try to learn something every time I squeeze the trigger... so when I'm doing these casual shooting activities I am usually using a rifle setup for something else all together. That doesn't stop me from using every rifle I happen to have along when shooting sod puppies! The number one situation where FFP reticles show their strengths is in tactical shooting, and what I mean by that is situations where you have limited time and one shot, or if you are lucky you might get a follow-up shot. For most of us this means running through a precision rifle competition. At these events you are presented with targets of various size at known or unknown distances in virtually every position imaginable. Shots can be from 11yds to well over 1000yds and you may only have a matter of seconds to find and engage targets. In these circumstances are where optics with FFP reticles really shine. You may not have time to run the turrets at a stage, so you will rely heavily on the reticle to apply your correct hold. You will often be shooting multiple directions, so your wind hold will move from left to right and dialing the windage turret will take too much time. I could go on for another full page about all the situations I can think of at a match where a FFP reticle would be superior to SFP, but I think you get the point. I have not yet encountered a situation where a FFP reticle was not able to get the job done. I get my fair share of paper punching in as well and again I have not encountered an instance where I wished I had a SFP reticle. A FFP reticle is kind of like a concealed carry weapon. I'd rather have it and not need it, than need it and not have it! The most important thing for you is to understand what you are using. Not everyone can afford the latest and greatest FFP rifle scope. Do not let that discourage you from shooting. There are new models being offered in FFP configuration by most major optics manufacturers at ever decreasing price points. Don't be a gear queer! Your optics are not the determining factor in whether you are a proficient shooter or not. So long as your scope is in good working order, you can be effective with it. Sure, having a $3,000 U.S. Optics 5-25x56 mil/mil/ffp definitely won't hurt you, but military snipers have been using mil/moa/sfp optics for a long time and have been very proficient with them. Equipment is important, but the only way you are going to find out what works for you is to use it. Only then will you have the knowledge required to determine if you need a different optic.